Dove Carnitas a la Killer Chefs. Photo: Jesse Morris. With dove season underway in the north and central zones, bacon wrapped dove breasts will soon show up on the tables of hunters everywhere. People don’t really like eating doves, they like eating bacon, if that’s the only way that they cook it. Jesse Morris is a hunter and chef with Killer Chefs in Richardson, Texas. He says there are more inventive ways to enjoy dove—including carnitas. Everybody’s go-to recipe—and there’s nothing wrong with it – is bacon wrapped dove. It’s nice to actually use all the bird. So, you can use the heart in the carnitas, and the legs, and the breast meat, and everything. Cooking that down low and slow; finishing it off, letting all the sugars come out in the product. It’s something good. If you’re a new hunter and longtime foodie, you may be tempted to “go gourmet” when preparing dove or any game. Jesse recommends to start simply. People get off on wanting to cover them in sauces or gravy, and things like that – when they’re really not tasting the bird, or whatever game that it is that they’re eating. When you’re first starting out cooking wild game, cook it simply: grill it; salt and pepper. See what the flavors that the actual game is, and then work with that. We have Jesse Morris’ dove carnitas recipe [below] at Passport to Texas dot com. One of my all-time favorites and go to recipe is carnitas. They are flavorful and easy to cook. My version of the recipe is not totally traditional. I like to lighten it up and use things that I can find around me in the late August early September months. If you don’t like the idea of using real sugar cokes, then don’t use it. You may substitute piloncillo, an unrefined sugar, and water. Add onions and garlic to pan and sauté for a few minutes. 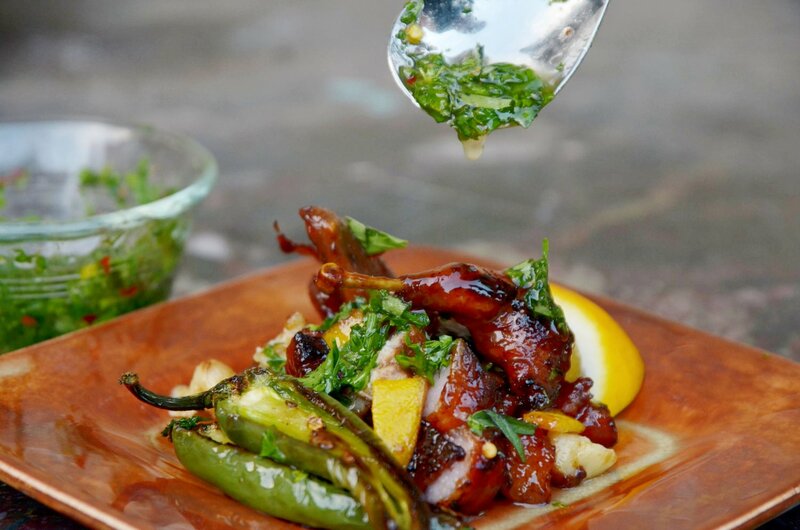 I prefer to garnish with charred jalapeno, chimichurri and a slice of lime or Meyer lemon. This entry was posted on Thursday, September 6th, 2018 at 12:00 am	and is filed under Dove, Dove, Food, Hunting. You can follow any responses to this entry through the RSS 2.0 feed. You can skip to the end and leave a response. Pinging is currently not allowed.